There can be few countries in the world that are so steeped in history as Turkey and Greece, and on this 16-day tour, you have the chance to discover the rich legacies of the past in this beautiful part of the world. Not only does Turkey offer stunning antiquities such as Troy, Pergamum and Ephesus along with the fascinating remnants of two great Empires, the Byzantine and the Ottoman, it will also dazzle you with spectacular scenery of mountains, fertile countryside, and coastal regions along the Aegean and the Mediterranean. From the exotic riches of Istanbul to carefree seaside resorts, Turkey never fails to impress its visitors. To add depth to this journey, your stay, first in the lovely Greek islands of Rhodes, Mykanos and Santorini and then in iconic Athens, gives you a taste of its lively culture, its delightful people as well as its ancient heritage that formed the basis of Western culture. This is a journey for the ages. Full day tour to include: Topkapi Palace (excluding harem), Hippodrome, Blue Mosque, St. Sophia and the Grand Covered Bazaar. Optional: Dinner with belly dancing entertainment. Morning departure for Gallipoli and visit Anzac Cove, Lone Pine Cemetery and Chunuk Bair, then across the Dardanelles to Canakkale for overnight at Kolin Hotel or similar. Tour the famous ruins of Ephesus and St. Mary’s cottage. Optional: Dinner at local restaurant. Drive through fertile valleys to Pamukkale (white lime cascades) visit Hierapolis and enjoy the thermal pools of our hotel. Overnight at Colossae Thermal Hotel or similar. Morning transfer to south, to the resort city of Marmaris, afternoon is free. Overnight at Anemon Hotel, Marmaris or similar. Morning transfer to port for hydrofoil trip to Rhodes, Greece. Arrive and transfer to hotel for overnight at Mediterranean Hotel, Rhodes or similar. A day of leisure; you may visit Old Rhodes or take an optional tour to Lindos. Transfer to the airport for a flight to Santorini. 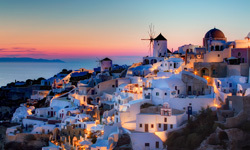 Arrival and transfer to your hotel for overnight at El Greco, Santorini or similar (2 nights). A free day to visit one of the many villages of Santorini, perched on top of the volcano, or enjoy a sun-soaked afternoon on the beach. Explore the many beaches of Mykonos and absorb the ambiance of this Cycladic Island during this day at leisure. Tour Athens’ famed Acropolis with its breathtaking view and renowned Parthenon, followed by a visit to the Acropolis Museum. On your own, explore the Plaka with its open-air taverns and traditional shops. A representative escorts you to the airport for the flight home.